Over the years, many of my blog postings have described runs on, or including sections of the Trail Around Middlebury, aka, “The TAM”. And why not? 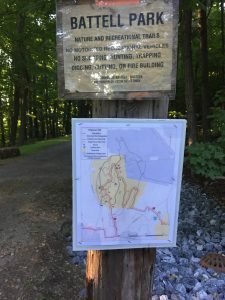 The TAM is the most frequently traveled trail in Middlebury, and the blog is, after all, “The Middlebury Trailrunner”. If the TAM is the gold necklace around our town, Chipman Hill is its diamond pendant. This gem, right at the edge of town, offers a roughly 500 ft vertical climb – making it a convenient place for local endurance athletes to train. When I first moved to Middlebury, in the mid-1980’s, Chipman Hill was only minimally developed as an outdoor resource. The old paved road over its twin summits, which was closed to vehicular traffic 30 years ago, a trail along its base on the east side, and a smattering of rarely used mountain bike trails constituted the “development” of this refuge. Over the years, many more, well constructed trails have appeared, many of them laid out by mountain bikers. 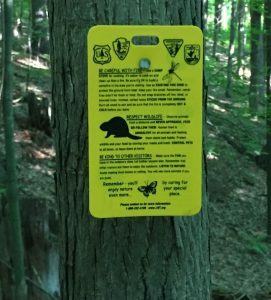 The rise of the the Middlebury Land Trust has led to some further trail improvements, and somewhat heavier use than in the past. But that said, on a pleasant late August evening, I passed about 8-10 other people, enjoying the hill as runners, walkers, or mountain bikers, and there is plenty of solitude up there still. 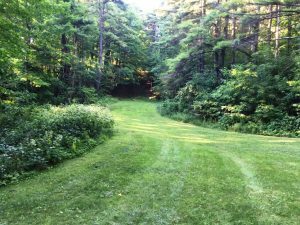 Some Chipman Hill newcomers might find the maze of trails, some maintained, and some not, confusing and daunting. The old road over the top is easy enough, starting from High Street (the street running behind the Swift House Inn), and ending on Spring Street (the highest driveable point on the south side of Chipman Hill). The trails, on the other hand can be somewhat confusing in places, some of them even confusing me, even after three decades of exploration. There is no need to worry about getting lost however. My usual rule of thumb when I get disoriented, is to simply hike to the top of whatever mountain I am on, and get my bearings back – most mistakes in route finding happen on descents (as some of my hiking and running partners will attest). Fortunately with Chipman Hill, if you don’t know where you are, you can always run away from the hill, and surprise – you will be somewhere in Middlebury when you hit a road. 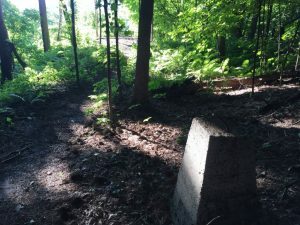 On most of my posts, I give a somewhat detailed trail description, but other than the simple run on the road over the top, which I actually did describe once a few years ago, the whole point of running on Chipman Hill is to try new trails, and see where they take you, and what points of curiosity you might see along the way. So, I am going to set up this route, by simply telling you where I started (In the Marble Works, and getting onto Chipman Hill from the end of High Street) and how I got back (the same way), publish the contorted and complicated route map on Google Earth (more for the sake of humor than actual direction) and show a few pictures from along the way. 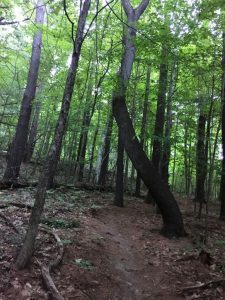 Some of these pictures are of locations on the hill which are well known, and others, on more obscure trails, are a little harder to find. 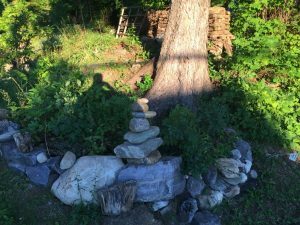 I am putting them up in the order in which I took them, making a bit of an easter egg hunt for friends who might want to explore the hill a little bit more than they may have in the past. I apologize for the general darkness of the pictures – a 6 pm run in late August can get that way, even on a clear day! The first well known landmark I came to, was the old ski jump hill. It is easy to see, as the runout is still mowed a few times each summer. Chipman Hill was used as the site of the Middlebury College Winter Carnival races during World War II, and a small ski facility was built on Chipman Hill to accommodate the racers and jumpers. I suspect that the road over the top may have once been a ski race trail, but I have no proof of this. A little later, I came to this curious sign, generated by the “Leave no Trace” organization, on a relatively obscure side trail. What was curious about it? Well this was the only sign of its type I saw, and it seems odd that the only “trace” on this part of the hill, was the actual sign. On the western side of the hill, there is a park bench with views of the Adirondacks, carved out of a small clearing. Curiously, starting right behind this seat is a concrete pylon, and 8 more of these pylons extend up the side of the hill, in a straight line, more or less evenly spaced. I have always been curious of these pylons – at first I suspected that they might have been used as part of some sort of ski lift in ages past, but why would they need so many of them, for what could not have been more than a pulley for a rope tow? And besides, descriptions of the ski trails used during the war never make mention of any lifts, although one friend claims to have seen a photo or sketch of Chipman Hill with a rope tow in it, although I have never seen this. If anyone knows what these pylons are for, I would be intrigued to hear. 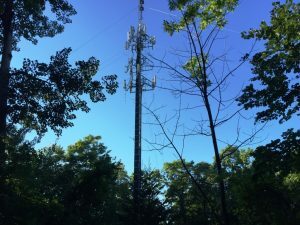 This is another easy find, as it can be seen from almost anywhere in town – the tall communications tower, on top of the highest point in town. I was also curious, on this run, to see if I could find any sign of the old, much shorter tower just to the east of the summit, but all the hardware associated with the older installation has apparently been removed. 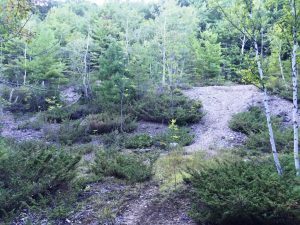 There is a rather substantial abandoned gravel pit on the lower, eastern slopes of the hill. This was much more pronounced in the 80’s, but has become somewhat overgrown in the last 30 years. Then, as now, it appears to be used for campfires (and presumably illicit outdoor underage parties), much like it was 30 years ago, as evidenced by at least 3 different fire pits. The gravel pit can be easily made out in the Google Earth projection of Chipman Hill at the end of this posting. 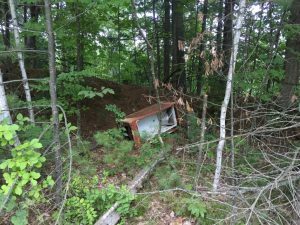 Here was an unpleasant surprise near the gravel pit – For the first time in my life, I noticed a long abandoned refrigerator, which was surprising in light of the fact that most of the hill is completely litter free, and it must have been there for a long time, as it has been decades since the gravel pit had routine vehicular traffic needed to dump off an abandoned appliance. This tree just looked cool, and was on a lesser used trail, so I guess this will be one of the more challenging Easter Eggs! 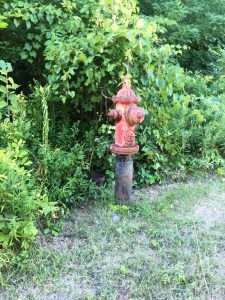 This fire hydrant, which I had never noticed before caught my attention, as it was on a closed, seemingly abandoned stretch of road. Who knows, maybe there were once plans to build homes on this part of the mountain? It also looks like it has unexpectedly grown since it was planted, as the hydrant itself was well above the ground line. I also noticed a bunch of bunny rabbits with their little white tails running around nearby – appropriate for a blog on Easter Egg hunting. They did not pose for pictures however. 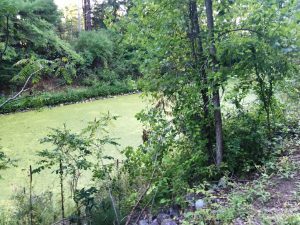 This muddy, algae-infested pond is what I have heard referred to as the old village reservoir. I don’t know the full history, but I for one am glad that we aren’t currently drinking from it. 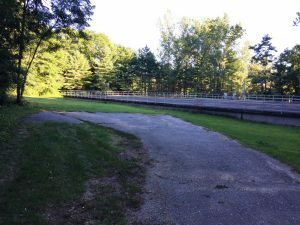 Just uphill from the old reservoir is – surprise – the new reservoir! I am comforted by the fact that it is actually enclosed. Coming up from the Springside Rd. access point, this well-designed map was posted – I am glad that I saw it at this point, after running for roughly and hour – who knows, I might have been lost all along and not known it? A copy of this map, which has the road, and most, but not all of the heavily used trails marked out, can be found online at the excellent MALT website. Finally, shortly after coming off the trails, and onto High St to conclude my run, I noticed this small cairn in a yard by the road – I have always rather enjoyed these little rock piles for some reason, and once again, in keeping with the Easter Egg theme, one can imagine a stack of chocolate eggs and jelly beans forming them? Concluding the run, I returned to my car in the Marble Works, finishing a slightly more than 6 mile run, where I basically didn’t do anything other than run around in circles. Although the altitude gain between the Marble Works and the summit is “only” about 500 ft, with all the ups and downs, I estimate I climbed and descended close to 1200 ft in the course of this run, making for a rather substantial hill climb run, without having to leave the village. 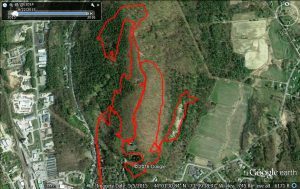 If you are a newcomer to running on the local trails, and want something a little more challenging, give this hill a try. If you are an experienced runner, see if you can explore the trails more thoroughly, to see if you can find any of the sights mentioned here that you are not familiar with. There are quite a few more trails, that I never even got to on this run, so perhaps in a year or two, I will include those to find some new Easter Eggs to share. OK – the first thing you have to be wondering is “What the heck is Pie and Beer Day?” Having lived many years ago in Salt Lake City, Utah, I always found the celebration of “Pioneer Day” on July 24 a rather curious holiday which pushes the notion of separation of church and state almost as hard as Christmas. It is a state holiday in Utah, celebrating the arrival of Brigham Young and the rest of the Mormons into the Salt Lake Valley on that day in 1847, and as a result made for a curious day off for those of us who lived there and did not follow that faith. Apparently, a few years ago, a tradition arose among the heathens (also curiously known as “gentiles”) of Salt Lake, celebrating the parallel holiday of “Pie and Beer Day” , which is generally interpreted to involve drinking beer (3.2 beer of course, as it is Utah) and eating pizza, instead of sitting in the hot sun watching a parade and eating lots of green jello salads. It sounds like a good counter-culture holiday to me! That said, the official reason for my arrival in Salt Lake was to run the Deseret News Classic Marathon, a road marathon through the mountains following the course of Brigham Young’s arrival into Salt Lake. So, while this was a road race for most of its length, it was on lightly-traveled roads in some very scenic mountains, and as such, it was a road race attractive to a Vermont runner accustomed to mountain trails. This Pioneer Day race is usually held on July 24, but since that fell on a Sunday this year, the holiday celebration was postponed to Monday, July 25 so as not to conflict with traditional Sunday activities. Since I probably wasn’t going to be taking many pictures during the course of the actual race, I scouted out the course on the day before in order to get a few shots for this blog, as well as to visit some roads I had not seen since the mid-1980’s when I used to bicycle up and down these passes after work. 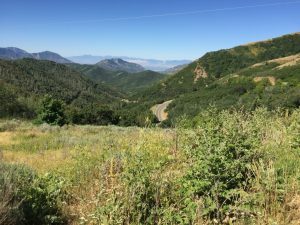 The start of the race is at Big Mountain Pass, the point where the Mormon Pioneers got their first glimpse of the valley of the Great Salt Lake. Of course, the view is equally intimidating to a runner, who can see how far away he or she has to go! While standing at the summit of the pass, I spied a historic marker I had never seen before. As it turns out, the Mormons were not the first to use this pass. That “honor” fell on the ill-fated 1846 Donner Party, attempting to follow the poorly described “Hastings Cutoff” on their way to California. The Donner Party took two weeks to cover the terrain from the top of Big Mountain Pass to the Salt Lake valley, constructing a makeshift road as they went, and this delay added to their delay in reaching the Sierras in time to beat the winter snows, and the rest, as they say, is history. On the actual morning of the race, the view was quite different from the above picture, for obvious reasons when one considers the big challenges to the marathon – heat, height, and humidity (as in lack of). While the race started high in the cool mountains at around 7400′, it finished in the searing mid-summer valley heat. In fact, on the day of the race, the weather report called for 102 degree afternoon temperatures – clearly unfit for running. So, the race started at 5:30 am, ensuring that the temperature at the finish line would “only” be in the 80’s for all but the slowest runners. The view was considerably different when we arrived at the start line at 4:30 am – dark, except for a well-lit area for the runners, and the glow of the city in the distance. And like almost every race I have ever attended, there were not enough portapotties at the start. So, it was dark, and being ever-chivalrous, allowing the female competitors to have first dibs at the limited resources, I headed for the dark woods to relieve my pre-race hydration issues. As I was quietly doing my business in the shelter of a few aspens, I suddenly found myself in a spotlight, and heard over a bullhorn “Please use the porta-potties”. 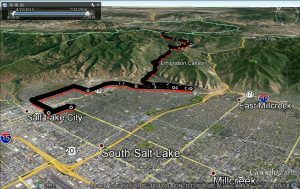 Ok – I got busted by the Salt Lake City water authority police, who were so concerned about the urination of a mere 300 hundred runners shivering atop a mountain pass 26.2 miles out of town, that they actually sent an officer on urine patrol! I laughed it off….and shouted back “Busted – too late” and stepped back into the crowds, hearing laughter and mild applause from the few runners who caught my little drama. But, I didn’t hear another bullhorn, so either the crowd was cowed enough to follow the rules, or perhaps the watershed authorities decided they had better things to do than to monitor the bladders of well-hydrated runners. By the time that the starting gun went off, it was barely bright enough to see, but I saw no sign that any of the 300+ runners fell off any cliffs on the tight, steep switchbacks at the top of the pass. I have done long races with long descents before, but this one was particularly hard on the legs, dropping 1500 ft in the first 4 miles, with no opportunity to warm up. I knew I would be paying for this later in the race no matter how fast I ran it, and I was correct. Within a few minutes, the glow of the sun illuminated the road, and the next challenge of the day presented itself, the only climb on the course, a short ascent to the top of Emigration Canyon, which then led directly into the city. This climb was only 350 ft, between miles 6 and 8, but the altitude was high enough to get me a little more winded than I usually would be on a modest climb like this. However, reaching the top of this second pass, I knew it would be all downhill from there until the last few miles on the valley floor a few hours later. The next 8 miles descending Emigration Canyon went very quickly, as well they should – the middle third of any marathon is usually the fastest part, and the long gradual descent made the miles go by even faster. 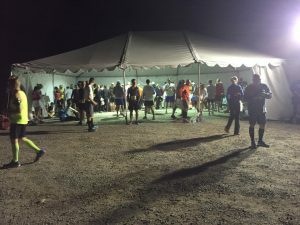 I could start feeling my legs tightening at around mile 10, however, paying the price for the early steep descent, and I knew that this would be an issue as I approached the finish line. At about mile 16, the race entered the benches on the hillsides of Salt Lake City proper, and the sun started to arise above the mountainsides. I also started looking at my watch more seriously, as the race organizers had mentioned that all runners who reached mile 24 at 9 am would be allowed to run along the downtown Pioneer Day parade route, and those who arrived later would be routed down an alternative route. Pushing as hard as I could as my legs got tighter and tighter, I passed the cutoff point with 4 minutes to spare, and had the pleasure of running past tens of thousands of folks out there for the holiday festivities, before finishing in Liberty Park – a location only a few blocks away from where I lived when I worked at the U. of Utah! My legs definitely felt the agony of the long descent in these last two miles however, as I was forced to walk much of it. All in all, this was a fun mountain race. While the marathon was modest in scope, I was impressed by the fact that the organizers managed to pull off a marathon, half marathon, 10K and 5K race simultaneously, making this a much bigger event than just a mere marathon, with thousands of runners participating more or less concurrently. And as I limped back to my hotel room, after a shower and nap, I feasted on pie and beer!